Diploma Master Brewer Dan employed juicy sweet Strawberries to tame the barbaric wild tart fermentation of rhubarb. Bright sour and effervescent. Thanks to GreenBayBA for this treat. 12 oz bottle poured into New Glarus Pilsner glass. Jammy red color, thickness is about what you'd expect a beer reproduction of a jam to look like. I can't really explain it any further than that. Head is bubble gum pink and 2 fingers in the NG Pilsner glass. Aroma is of strawberry jam and bread, perhaps on the sweeter side like an angel food variety but not quite as sweet. Earthy rhubarb hangs out in the distance and light touches of bubble gum can also be detected. Flavor is "tip your head back" good. Luscious bready rhubarb cobbler meets HUGE strawberry jam and doughy pie crusts. Salinity is also a highlight, it has quite a bit of salt which is true to the natural state of rhubarb. Explosive. Feel is likewise near-perfect, with a fantastic fruit acidity, heavy handed prickly carbonation, and a slick, jammy finish. Overall, this beer deserves a much better rating than "outstanding". World class all around. The only logical assumption I can come up with is that people are reviewing this beer not expecting it to taste sweet. For those people, get some beer education and learn your styles. This is spot on crazy good artisan beer. L: A dark red, hazy body with a thin, almost pink head. Right off the bat, the look of this beer took me my surprise - it almost looks like strawberries out of a juicer. S: What a wonderful smell! Fresh strawberry pie, strawberry preserves, fresh-picked rhubarb and strawberry from the garden. T: The taste follows up the nose perfectly with a massive strawberry and rhubarb explosion. The carbonation is perfect, and it feels like scooping the freshest strawberry preserves you can find into your mouth with each sip. F: Again, the carbonation was spot on and it left me wanting more after each sip. The body was a tad thicker than I expected, but it made beer better in my opinion - as it seems like they were going for liquefied strawberry pie (they nailed it). O: This is definitely a beer I will seek out time and time again. New Glarus has always done exceptional things with fruited beers, and this one may take the cake for me. What an excellent offering! The basic gist I got from this one was "strawberry fruit roll-up". Very sweet, with a heavy body, although it does have a surprisingly dry finish. Fruit rollups were a treasured luxury of my childhood, so the ultrasweet experience is not without its merits. I'm not sure what rhubarb tastes like, aside from my mother subjecting me to unpleasant prickly sensations from her garden as an infant, and warning me not to eat the leaves. I left rhubarb alone after that. All I know is a 12oz pour of this is a study in strawberry, and by the end I was schooled. My wife drank about 3oz, declared she was "over it", and poured her share into my glass. I'd like this a lot more if I could glean something other than strawberry from uncapping to finish. It's just a strawberry sugar bomb that's not unpleasant, just not suited for 750ml quantities. A - Opaque pink/red strawberry colored pour with a pink lacing ring that's creamy and bubbly. S - Strawberry, rhubard, and creme. That's it. M - Medium body with a wet finish. O - If I want Tropicana fruit juice I'll go to the grocery store and buy some. No thanks. Thumbprint 12 oz. bottle, released 2017. Thanks to EehaiCJ for the assist. Deep dark red with a thin layer of foam and spotty lace. Nice color. Smells like artificial strawberry candy, strawberry kool-aid, off brand strawberry jam. Tastes very sweet, cloying strawberry candy in liquid form. Gross. Sticky sweet, light to medium bodied with a slick artificial strawberry aftertaste. Nowhere near the balanced sweet/tart/natural fruit of the original batch, 2017 is a complete bizarro version. Avoid. Gave away the rest of the 4-pack. Tried it a 2nd time, and it still tasted like artificial strawberry candy, though there was a very mild rhubarb tartness present. Not really enough to redeem it. This reminds me of stuff clueless underage kids might try to buy at the liquor store. Worse than Four Loko or similar fruit flavored malternatives out there. Sad! Split a 750ml bottle with family and it went over pretty well. Reddish orange with a crimson highlight, lasting foam with arcs of sticky lace in the glass. Patchy skim on the surface after a few sips. Body has a bright clarity and the occasional stray rising bubble. Flecks of spotty lace in the glass. Sweet strawberry in the nose, hints of light acid and mild funk, though fairly restrained. Tart and creamy, big strawberry flavor with acidic tartness from the rhubarb. Light and spritzy, lingering fruitiness in the aftertaste. On par with the other fruit beers they make, about as tart as Serendipity, the strawberry taste is pretty assertive. 750 ml bottle was poured into a snifter. Appearance: A two finger head was poured that reduced to a thin layer. It is a hazy yellow amber color with no vision of anything. Spotty lacing down the glass as the beer was drank. Smell: Strawberry jam deliciousness. Sweetness and bready notes too. Taste: Where's is my toast so I can spread this beer all over it? Strawberry jam heaven. Mouthfeel: Smooth, light bodied, medium carbonation, sweet, a little dry, and a little chewy. Overall: Wish they can make more of this in the future. So cool. Pours to a cloudy ruby red appearance with little to no head. Smells like straight up strawberry jam. Taste is just as sweet with plenty of strawberry wafting across my palate but no acidic kick to clean up the finish like you get from Belgian Red. Actually comes across somewhat cloying. Feel is medium to medium heavy with no carbonation. Lots of high scores for this one - your mileage may vary. One 4-pack is enough for me. Wow. What a great beer. Hazy red color. Nice head that reduces to a thin ring that stays. Smell has strong fermented strawberries. Taste is exceptional. Strawberry starts with the rhubarb finish. Excellent taste t the style. Nice carbonation in the beer. Finishes crisp. 750ml purchased in July in Madison, WI. Shared over this past weekend with a few friends. A- Murky pink and red infused pour to a snifter with plenty of things in solution providing haze. A white head rises up to one finger with a frothy texture falling to a ring and big bubbly islands. Pretty good retention and lacing ends up mostly spotty but plentiful. S- Strawberry. Strawberry. Strawberry. A blast of fresh picked berries rises out of the glass with the feel of jam and fresh berries. I don't really know the smell of rhubarb but beyond the berries is a classic sweet syrup aroma found in all of these NG beers. T- Fresh strawberries mixed with a tastefully sweet strawberry jam with a hint of tartness which must carry in from the massive amount of fruits. Rhubarb a bit for me but it blends in well with the strawberries. MF- Fairly light bodied with a certain thickness from the fruit long chain sugars left unfermented. Slightly oily with medium carbonation. Smooth foamy, puffy consistency and a mildly tart finish. I wish I had more words to say besides strawberry but that describes it very well. Once again, New Glarus captures a fruit flavor better than anyone else. Really didn't know what to expect in this. My first try of any NG beers. Visually not super appealing with the murky brown tinted red color. Great smell on this, fresh strawberry and red fruit. Taste was fine, I would've been more on board if it had some tartness going on. Rather it left me thinking strawberry jam. This pours a gorgeous, inviting berry red. It is quite unlike any color I've seen in a beer. The smell confirms the beer's name: the strawberries are very prominent on the nose. I am typically not a huge fan of fruited beers, but something about the strawberry smell makes me excited to try this. I had a little trepidation that the strawberries would be overpowering, and I wasn't wrong. This is very tart, but not unpleasant. I am surprised that this has a little thickness to it that coats the mouth and throat nicely. I was not expecting that. There's quite a bit of carbonation that leaves a tingly sensation after you swallow. Overall, it's a little too much on the tart side, but still a solid beer. Big thanks to Jeff for this one. My girlfriend's super excited! 750ml bottle into Tired Hands stemware. Shared with schen9303. Pours a massive, frothy, 3 finger light cream colored head with moderate to low retention. Beer is a clear mahogany rust. Lacing is stringy and spotty with great stick. Great looking brew! Nose is sweet and aromatic. Strawberry rhubarb pie. Juicy with a ton of fruit puree. Excellent. Opens sweet strawberry puree and juice. More of the same in the middle with a slight cinnamon sweetness and that signature New Glarus yeast flavor. Ends sweet and syrupy. Aftertaste is more of the same. Simple but enjoyable. Light bodied with ample carbonation. Prickly and carbonated in the mouth and goes down syrupy. Finishes quick and abrasive with a lingering, sticky aftertaste. Solid. This is pretty in line with the rest of New Glarus' fruit offerings. Clean, simple and delicious. I'm glad to have gotten to try this and I hope they keep this in the regular lineup. M) Left the mouth dry, but very smooth beer. O) Well, i am not trying to knock this beer. Not Dan's best fruit beer or "sour" I don't know if any Brett was used tasted like it. Overall, try it I enjoy Serendipity more than this one. Pour is a murky copper with some ruby edges and a tight tan head. Nose is earthy up front, root notes, strong strawberry fruit rollup comes in behind. Taste is more clean strawberry jam with a faint earthiness to balance. Really soft body and fairly assertive carbonation with a semi dry finish. A hint if tartness in back as the bright strawberry jam lingers. This beer has a lot of strawberry and is very reminiscent of a strawberry rhubarb pie. 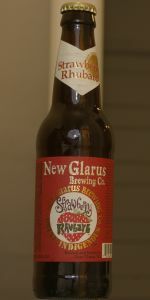 Spot on for New Glarus in that regard, but overall it is just too sweet of a beer.